A wound is the breakage of normal alignment of body cells with or without destroying them, which may impair or stop their function. Wound causes can be internal or external in origin. Wounds of internal origin are mainly due to impaired circulation, neuropathy or medical illness. Wounds of external origin are due to an outside force or trauma that causes open or closed wounds. Impaired circulation: This can be from either ischemia or stasis. Ischemia is the result of reduced blood supply caused by the narrowing or blockage of blood vessels, which leads to poor circulation. Stasis is caused by immobilization (or difficulty moving) for long periods or failure of the regulating valves in the veins, which leads to blood pooling and failing to flow normally to the heart. Neuropathy: This is seen mostly in cases of prolonged uncontrolled diabetes mellitus, where high blood sugars, derivative proteins and metabolites accumulate and damage the nervous system. The patients are usually unaware of any trauma or wounds, mainly due to loss of sensation in the affected area. Medical illness: When chronic and uncontrolled for long periods (such as hypertension, hyperlipidemia, arthrosclerosis, diabetes mellitus, AIDS, malignancy, morbid obesity, hepatitis C virus, etc. ), medical illnesses can lead to impairment of the immune system functions, diminishing the circulation and damaging other organs and systems. Contusions: These are a common type of sports injury, where a direct blunt trauma can damage the small blood vessels and capillaries, muscles and underlying tissue, as well the internal organs or bone. Contusions present as a painful bruise with reddish to bluish discoloration that spreads over the injured area of skin. Hematomas: These include any injury that damages the small blood vessels and capillaries resulting in blood collecting and pooling in a limited space. Hematomas typically present as a painful, spongy rubbery lump-like lesion. Depending on the severity and site of the trauama, hematomas can be small or large, deep inside the body or just under the skin. Crush injuries: These are usually caused by an external high-pressure force that squeezes part of the body between two surfaces. The degree of injury can range from a minor bruise to a complete destruction of the crushed area of the body, depending on the site, size, duration and power of the trauma. Abrasions: These are shallow irregular wounds of the upper skin layers, due to brushing against either a rough surface or a smooth surface at high speed. Abrasions usually present with minor to no bleeding, and some pain that subsides shortly after the initial injury. Lacerations: These wounds are tear-like wounds with irregularly torn edges that are usually deeper than abrasions and cause more pain and bleeding. Lacerations are generally caused by trauma or contact with an object, as might result from hard blows, collusions or accidents. Incisions: These are most likely the result of a surgical procedure or skin cut with a sharp object such as a scalpel or knife. Incisions are mostly linear in shape with smooth, even edges. Depending on the depth and site of the wound, an incision can be life threatening and cause serious damage, especially if it involves vital organs, major blood vessels or nerves. Punctures: These are small rounded wounds that result from objects with thin pointed tips, such as needles, nails or teeth (in cases of human or animal bites). The wound size, depth, bleeding and pain are directly related to the size and force of the causative object. Penetrating: This type of wound can be caused by any object or force that breaks through the skin to the underlying organs or tissue. A penetrating wound has variable sizes, shapes and presentations depending on the cause. Penetrating wounds can be life threatening, causing serious injury, especially if involving vital organs, major blood vessels or nerves. Gunshot wounds: These are considered to be penetrating wounds that are exclusively caused by bullets from firearms. The wounds at the entrance site of a bullet are regular, rounded, and smaller than the bullet size. Entrance wounds may have burn marks or soot on the edges and surrounding tissue, depending on the distance from which the bullet was fired. If the bullet goes all the way through the body, the exit wound will have an irregular shape that is larger than the entrance wound and usually bleeds more. Aside from the risk of hitting vital organs or major blood vessels, the fast, spinning movement of the bullet may cause serious damage to the surrounding tissue it passes through. Impaired circulation: In cases of both ischemia and stasis, the supply of blood, oxygen and nutrients, as well as flushing of extra waste products, is impaired. This results in tissue death and wound formation that may develop later to venous and arterial ulcers, or gangrene. Diabetic foot ulcers: The part of nervous system responsible for sweating and moisturizing the skin is impaired, leaving the skin on the feet dry and vulnerable to cracks and injuries. Due to the reduced sensation of that area, many skin cuts, cracks or injuries can go unnoticed and progress to ulcers. Charcot or neuropathic joints: The part of nervous system that controls the muscle of the leg and foot is damaged, leading to improper distribution of force and pressure while performing routine activities. This can eventually cause joint dislocation, deformity, fracture and injury. Medical illness: A weakened immune system and other malfunctioning or diseased systems decrease the ability of the human body to defend itself against infections, inflammations, ulcers or wounds. A weakened immune system can also delay or prevent wound healing. Compartment syndrome: This syndrome involves the lower and/or upper limbs (especially the legs and forearms), where the damage causes swelling and increased pressure in the fascia that surrounds the muscles, nerves and blood vessels in that area. The increased pressure can block the blood supply to the affected limbs, causing severe damage to the muscles and nerves. The damage can be permanent, leading to loss of function, and may necessitate amputation. Infections: Except for surgical incisions, most open wounds are caused by dirty, contaminated objects that carry different types of bacteria and organisms. An infected wound may present with a foul odor, pus or yellowish drainage, fever and pain. Inflammation: This can result from the body's immune response to a foreign material that caused a wound. Inflammation can make the wound area red, hot, swollen and painful. 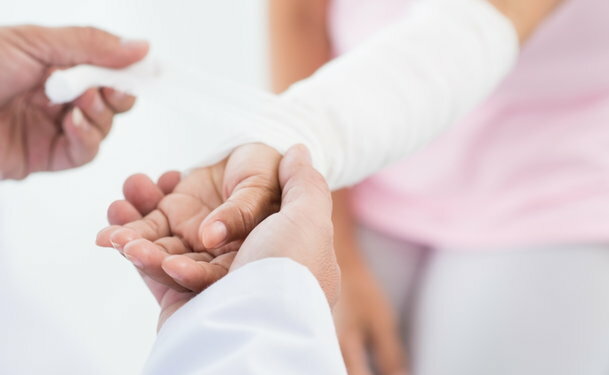 Loss of function: Whether because of the pain or the trauma itself, loss of function can be temporary or permanent, depending on the extent of the wound and the damage to the affected limb or area. Scarring: Many open wounds will leave a scar after healing, and some may even cause a deformity of the affected area, especially with penetrating, gunshot or deep laceration wounds. Heavy smoking, alcohol consumption and increased age: These factors can reduce the elasticity of blood vessels and increase the probability of blood clots, leading to vascular related disease and improper healing. Immobility: Whether standing, sitting or lying down for long periods, as in cases of severe burns, multiple surgeries or car accidents, immobility can cause stasis and increase the risk of developing bed ulcers, venous ulcers, deep vein thrombosis and varicose veins. Unhealthy lifestyle: These risk factors include limited exercise, poor diet, obesity and poor hygiene. History of chronic medical illnesses or vascular disease: These illnesses include cancers, diabetes, high cholesterol, AIDS, heart disease, hypertension, atherosclerosis, anemia, varicose veins or deep venous thrombosis. The best way to treat wounds of internal origin is to prevent them from occurring in the first place. Prevention is accomplished through controlling any underlying chronic medical condition by complying with the doctors’ treatment plan and medications. Additionally, wounds can be prevented by maintaining a healthy lifestyle that includes regular exercise, proper hygiene and a balanced diet, as well as cessation of any bad habits such as smoking and drinking alcohol. In closed wounds of external cause, the main goal of treatment is to control the pain, and keep the bleeding and inflammation to a minimum. This is done by using ice packs, compression, elevation and immobilization of the affected limb or area. However, in cases of compartment syndrome, a physician can make linear surgical cuts through the fascia to alleviate the pressure. The wound is usually left open for two to three days while covered with a sterile bandage to allow the swelling to subside and prevent further pressure from building up. Stop the bleeding: Apply gentle pressure over the wound with a clean bandage for twenty to thirty minutes. Try to avoid checking frequently to see if the bleeding has stopped, as this may prevent the blood from clotting as needed. Clean the wound: Remove the causative object(s), wash the wound with clean water, and flush it with a sterile solution (using an irrigating syringe) to remove any bacteria or remaining debris. In some cases, a surgical debridement is necessary to remove the dead tissue and all of the foreign material that couldn’t be removed during initial cleaning. Debridement provides a clean environment that stimulates healing. Local antibiotic: Apply a thin layer of antibiotic ointment (such as Neosporin) on top of the wound to reduce the risk of infection. Wound closing: Wounds can be closed with stitches, staples, skin adhesive bands or sterile bandage wound dressings (for abrasions). However, in cases of infected surgical wounds, the wound may be left open after surgery until the infection resolves. Closure of an infected wound can lead to more complications and failure to heal properly. Dressing change: Change the wound dressing at least once daily, particularly when it is wet from blood or drainage. In general, X-ray can be used for closed and open wounds, if bone fracture is suspected. Fractures generally require casting. In cases of severe trauma, other forms of imaging may be used. These include ultrasound, CT scan and MRI to detect organ damage or internal bleeding. The use of crutches and other walking aids may be prescribed to immobilize the injured or fractured limb, preventing further damage, reducing pain and accelerating healing. If it has been more than five years since the last tetanus vaccination, a booster or new tetanus shot should be given. This is especially important in cases of deep, dirty, contaminated wounds, or in those caused by human or animal bites.